The Model 231RS wet-to-wet differential pressure transducer with remote sensors reduces labor, materials, and time. 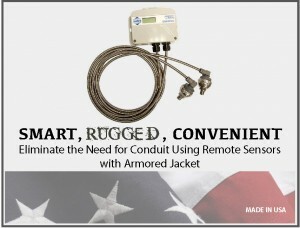 The differential pressure sensors are installed directly into the pipe and electrical connection is made between the remote sensors and the Model 231RS via cables or conduit, reducing labor cost by one-third and the cost of copper to connect the pressure transducer to the pipe. Startup time is reduced since purging the air out of the lines is not necessary. The Multi-Sense Model 231 Wet-to-Wet differential pressure transducer's all inclusive design provides users with field accessible ranging, choice of output and field zeroing.